May I ask your good office to send this message to our fellow ABRENIANS for help in regards with the recent typhoon Yolanda victimizing our kakababayan in Visayas region. RELIEF DONATION IS NOW ACCEPTED AT YANNIE’S PARTY SHOP & GM, MCKINLEY ST, BANGUED, ABRA. THIS WILL BE SENT OVER TO THE VICTIMS OF TYPHOON YOLANDA. ***I DO NOT ACCEPT MONETARY & GROCERY DONATIONS SO AS TO AVOID CONFLICT OF INTEREST. ***THIS DONATIONS WILL BE OFFICIALLY TRANSPORTED BY RED CROSS, ABRA CHAPTER. FOR MONETARY DONATION PLS VISIT THE WEBSITE. And I feel that we should all help each other in times of needs. « New APH Finally in Full Operations? I would like to appeal to fellow Abrenos to help in any way we can our brothers and sisters in Eastern and Western Visayas, Palawan, Mindoro provinces and the Bicol region. Time is of the essence. Let us act now. MR. Abrenio with all due respect, how could you encourage our kababayan in Abra to help the Eastern and Western Visayas, Sir ania ngarud iti maited daguitoy nga ka probinsya tayo ket ag kukurang da pay ti pab Biag da. Mr. Abrenio, apay saan mo diretswen da APO GOVERNADOR , NI APO CONGRESSWOMAN, ken dagidiay MAMAYORES ti ILI nga ABRA,Agdepdepel da laeng ti BUGGOONG ken ASIN piman saan mo nga maawatan ti panagbiag ditoy ABRA SIR. Jesus Christ, your are one of those atypical Filipino always want to say something that humiliate others effort. We might be underprivileged but we do have hearts. My apologies, Awan Pusom. I’m sorry if you believe people in Abra are so poor that they cannot give help. I know how impoverished our people are. But many of our brothers and sisters have lost lives and everything they have. I am not asking you to help if you are not in a position to help. My plea for help goes out to everyone and that includes government officials. Perhaps, we only have to look around us to know how far more blessed we are. I am sorry if I offended you. I live in Abra. I have seen how hard up our people are. Victims of Typhoon Yolanda lost everything. Can anyone be any poorer than that? Some of them have not eaten anything for four days. I never thought my appeal would offend people. I am sorry. Please do continue on your effort, I would fully support you. Soon later, I would ask my family to bring boxes of clothes from Australia. Please don’t apologies to a dump person, who doesn’t used his/her front lobe before typing the words. Who ever you are, I just want to tell you right now that you don’t have business to make judgement to every person, I’m just trying to explain to you about life in Abra. Okay you collect P38,000. pesos, BIG DEAL how could you know that money will go to those people in VISAYAS. You know what, we just pray our kababayans in Visayas. and don’t worry they have $301,000.000.00 come from other coumtries. Jesus Christ, your are one of those atypical Filipino who are always want to say something that humiliate others effort. We might be underprivileged but we do have hearts. Thank you very much, Q. Gemma Angel Medrano is the one who initiated the appeal for help. She deserves all the credit. I just want to help in my own small way.God bless. For the elected officials: congresswoman, governor, and mayors. You have a yearly calamity funds. Since Abra is lucky to have been spared from calamities for,many years, it is believed that you have enormous savings. This is now your opportunity to do something in the name of the province of Abra to extend help to ease the sufferings of our countrymen in the visayas. Siguro, mabalinyo pay nga isakrificio ti maysa nga Domingo nga awan tadi ket itulongyo laengen ta pustayo kadagiti victima ni Yolanda; bareng daytoy ti pangaasian ti Dios nga manglisi nga agtultuloy kada tayo ti umasping nga didigra. May God continue to bless us. I take pride in the potent memory of what have always been inculcated in my mind about being taga-Abra. And it is that, however poor one was, he would always find a way to ‘makisaranay’. It might not be monetary. It might not be be a commodity in kind. It could be a fervent prayer in the heart that others, too, be graced by the good heavens above. The havoc that the wrath of nature in Yolanda has lashed unto our fellowmen is heartbreaking. It is humane that we empathise in anyway we can. It would be a sad disgrace to not even be able to spare that. I absolutely agree Tagamasid and Madam Norma. That is why I wrote in my appeal “in any way we can”. I fully understand Awan Pusom too and that is why I said I am sorry. “As of yesterday, the collection/pledges received by the Abra Community Broadcasting Corp. (ACBC), of DZPA AM and DWWM Spirit FM Radio Stations for the victims of Typhoon Yolanda in Tacloban and Leyte is at P38, 000.00. On Monday, Bishop Leopoldo Jaucian of the Diocese of Bangued appealed for help for our devastated fellow Filipinos in the Visayas and since then, donations poured forth from our very own Abrenios, in cash and in kind. The said donations will be turned over to the Bishop of the Diocese covering the said provinces. Once again, the Abrenios have reached out to extend help in these darkest hours just like we did during the Zamboanga siege and after the onslaught of Typhoon Ondoy. God bless us all. Bless your good hearts, fellow Abrenians! Ito ang katutuhanan na masakit tanggapin, ang 38 000 pesos ay average lang na pusta ng isang manok ng mga swap….. Na mayoress sa ‘ulutan’ sa Weekends. ( i used to watched cockfighting until 2 yrs ago ). Ito ang pagkatao ng karamihan ng pinuno natin at ibang may kaya sa buhay. Kunwari palasimba ngunit sarili lamang ang mahalaga at wala sa puso ang tunay na makatao. At pagkamakaDios. While around 10 percent have more than enough, some 30 percent are living in extreme poverty with 2 or less meals everyday. Japanese and communist countries have no gods but their ancestors and leaders but they understand the true meaning of compassion, love and self respect. We claimed to be Christians, but our attitudes is worst than those who don’t know our lovingGod. Sorry for my comments about the meager amount of donations. I didn’t notice that monetary contributions is discouraged. Sapay koma ta dagiti adda mabalinna, kungrunaan dagiti agtuturay ket mangriknada nga mangiburay ti ayatda kadagiti kakaasi nga biktima ni Bagyo Yolanda. Uray kadi ti calamity fund yo ti maysa nga tawen laeng, gov, cong.,mayors bareng isu ti agtultuloy nga pangangaasian ti Dios AMA nga mangileklek ti Abra ti aniaman nga didigra. I would like to ask an apology to the people that, if I have ever offended them what I post earlier. I’m very sorry, what I said, that you think I’m a cold stone heart,the only reason I said that, just because we have a Govt. that’s corrupt, why in the world that OUR BELOVED GOVERNOR suppose to do the same what the GOVERNOR in Isabela did. Ay wen apo naka adaddu ti kuarta daguitoy nga binutosan tayo.APO TAKIT dagidiay SIR, nga imbulsam nga kuarta ken ni Congresswoman, Mayors in the entire of ABRA, Wake up you be ashamed of your self. Thanks. i strongly urge also top brasses of the PNP to please help the people of ABRA specifically in LAGAYAN. Townspeople there were afraid to go to their livelihood because of rampant indiscriminate firing of PAGS. KAKAASI KAMIN APO DITOY LAGAYAN TA MADIKAMI MET MAKABIROK TI PAGBIAG MIN TA MABUTENG KAMI METTEN MAPAN AGKALAP TI LAMES KEN MAPAS MANNGED TI GAPAS. DITOY PULOT APO KET AWAN PAYEN TI MAPAN AGGAPAS TI TINALONAN GAPU TA MABUTENG KAMIN. URAY AWAN BASOL MO DITOY KET NO MKITAM DAGITA NGA PAGS KET PATAYEN NAKA MET. PANGNGAASI YO TA TULUNGAN NAKAMI KOMA. Jay Visayas ket sabali ti kaso da ijay ngem kasla parehas met lng ditoy lagayan ta madi nga agpayso nabagyo ngem awan metten makan ti tao gapu ti buteng mi nga mapan agsapul ti pagbiagmi. Uttig, I commend you for your courage to speak up. The people of Lagayan have suffered long enough. They have no one else to turn to. Gov. Takit is the father of the province. Lagayan is very much a part of Abra. Mr. Governor, do you still remember the giant billboards you put up in Bangued after the death of your brother? The billboards screamed, “Thou shall not kill”. You placed the picture of your brother and several victims of murder in those billboards. Your intention was crystal clear- to win sympathy votes. Fast-forward to the period after your victory in your first run for governor – what followed was the darkest chapter in the history of Abra. People were being butchered left and right, at times on a daily basis. I never heard you say, “thou shall not kill” anymore. It is your sworn duty, Mr. Governor to implement the law and to do justice to everyman. But you just sit idly by while your people are being murdered. “To whom much is given, much is required; and to whom much more is given, much more will be exacted”. Mr. Governor, you will be judged not just by the things you have done but more so by the things you should have done but refused to do. Lagayan, La Paz, Danglas, Dolores and Bangued have perenially been the places where the law of the jungle prevails, where might is deemed right, where respect for human life has become a thing of the past. Mr. Governor, you have been sitting on your fanny for far too long, feeling safe because you are surrounded by your security people. There is a calamity similar to that wreaked by Yolanda as expressed by Uttig in Lagayan. When will you act? When will the PNP act, aside from just going through the motions and filing cases against people they do not want to name? You all know who is responsible for the attrocities in Lagayan. The time to act is now. Tomorrow may be too late. Our people only want to earn a living. Is that too much to ask for? @Uttig, Is there any way that these PAGS be taken photos of? Pics can be stolen-shots and even random, using mobile or cell phones and then upload in internet social media. Indicate the place where the photo was taken, the time when it was taken, the identity of the PAGs if at all possible and the incident of interest. This can be done with the uploader not having had to identify himself – for safety. This can then be circulated in social media. It’s a way to get the issue to the attention of those who can do something about this. Oh my God, there’s no way you could identify this PAGS, especially in LAGAYAN, these people are all protected by the Government of ABRA. we all have seen the devastation and loss of lives, typhoon Yolanda had brought into our country. indeed a terrible catastrophe for the world to see and for the world to unite in helping us. my heart and emotions are one with millions out there who feel the same but could not grasp the true reality and hardships our countrymen are suffering right now, they felt , they saw and they heard the howling of the winds and incessant rains, and from it death, hunger and helplessness…I wanted to cry but could not because of Anger at the way governance was and is being trampled and corrupted from the lowest level of government…few selected generations of people enriched themselves from the vaults of people’s money intended to build infrastructures, buy reserved food and other public needs. wantonly and shamelessly using public funds to build mansions, luxurious cars, condos, jewelries and best foods money can buy for their families not minding the commoner in the streets who has nothing at all…reading the total donation of 38thousand from our province, i start to wander where have all the leaders gone? the leaders who can bet hundreds of thousands of pesos in a cockfight? the leaders who intentionally build low quality roads and projects? the leaders who paid and bribed thousands of pesos to win in the election? the leaders who try to outsmart and outdo their fellow leaders in project procurement and SOPs? for once LEAD in this humanitarian effort to help our fellowmen in dire need of basic things to survive. shell out some of OUR money, pls…you may have done theses things in your own private ways to help but organize one coming from abra itself to show that we one with them and that we care too. I agree absolutely Sir Neil. Our people have been benumbed by graft, corruption and violence as though these were the natural order of things. Many of our people have lost their sense of right and wrong. Amassing wealth through all means, fair and foul, have been the order of the day for most of our public officials. It is so disappointing to see a few good men offer themselves as the better alternative in the elections only to fail and even reap scorn from people who know no better. Perhaps, our people have come to love their chains too much that they are no longer outraged by public officials flaunting their ill-gotten wealth. It is indeed a crying shame that our public officials are blind and deaf to the unspeakable calamity that has visited our fellow Filipinos in the Visayas. When will we ever have public officials we can be proud of? While we are on the issue of extending help to people desperately in need, may I share with everyone the words of St. Albert the Great, “IT IS BY THE PATH OF LOVE, WHICH IS CHARITY, THAT GOD DRAWS NEAR TO MAN, AND MAN TO GOD. BUT WHERE CHARITY IS NOT FOUND, GOD CANNOT DWELL”. I am a dreamer. In case our public officials are touched and decide to give help to the victims of Typhoon Yolanda, may I request them to give their contributions incognito. It may show your sincerity because you cannot be accused of contributing in order to earn pogi points. Just this one time, shed your EPAL, please. Per Lee Collo (Abra media In Action), donations towards the Yolanda disaster victims and survivors continue to flow in. Way to go fellow Abrenians! Incidentally, Neil (above) is doing his part to help. A number of Abrenians are leading donation drives. Others are quietly onto similar helping-hand and outreach efforts. All these, in the face of scarcity that the province is in. This sense of decency just couldn’t be a rarity. And how touching it is, that it is from the ordinary folks that it emanates. One wonders then about the ‘privileged class’ or those in government positions who pin ownership to their posts and regard these posts as their private personal play pens; whether they are endowed with lucid intellect to discern grace of heart and mind from the shameful grip of inequity. Or has man’s primal nature allowed unbounded authority to simply overwhelm his sense of conscience and humane decency…. Where are you die-hard followers of corrupt politicians? Are you only good in opening your big mouth during the heat of political campaign? Why can’t you defend them against all kinds of humiliation they are reaping right now? Abrenians all over the world are waiting for your defense or rebuttal. Come on, speak up now or forever be ridiculed by even your small circle of friends and relatives which majority of them are laughing secretly behind your back or hiding their faces with shame. It’s really nerve-cracking for you’re already losing your honor or dignity in spite of the fact that some of you were even professionals or highly educated. Prove that we were wrong by donating at least 10% of your prostituted wealth to the victims of this wrath of nature because of your wickedness. If you have a little common sense left, place take this as a warning that if you won’t stop stealing and killing God’s people in the province, you and your loved would be next! Yes, you and all the corrupt politicians all over the country are the main reason why the Nature is pouring out his wrath to us for you to realize that what you’re doing are against His Will. For you who were not God’s people yet, better join now to any religious group/s (I don’t think it’s a sin to hear the words of God from the different kind of religions offering Bible studies) and seek relationship with God and His son Jesus Christ before it’s too late for you to repent. Save your loved ones against these natural disaster/calamity that may still come and we can not stop their occurrences until these thief and criminal politicians learn how to fear God. Think smart for once in your life, will you? 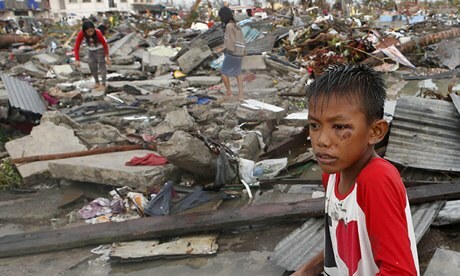 We have witnessed how our fellow Filipinos was devastated by the super typhoon Yolanda. most of us wept with the scenes we saw on TV. Foreign volunteers also could not hide their pain as they witnessed thru their own eyes the havoc brought about by the typhoon. The community of nations have shown once again that we are a family regardless of race, skin colors, and belief by the way it responded to somebody in agony. On the other hand, Some of us were shamed on the loathings and other conducts unbecoming to human that happened amidst these crisis that was broadcasted in TV all throughout the world. We still have to seek the true humanity in us specially when we are in a difficult situation. With the relief efforts of many individuals and organizations, Samar, Leyte and Cebu will rise again for sure. On a side note, why does it takes too long for this relief goods to reach its destinations? Definitely, there are untold stories of heroism, and some who took advantage of the situation for their personal interest. Let us not forget the teaching of Jesus on helping others: “whenever you give alms, do not sound a trumpet before you, as the hypocrites do in the synagogues and in the streets, so that they may be praised by others. Truly I tell you, they have received their reward. But when you give alms, do not let your left hand know what your right hand is doing, so that your alms may be done in secret; and your Father who sees in secret will reward you” (Matthew 6:2-4). In every Christmas for many years now, one good Samaritan, make a habits to took care of the hospital bills of poor patient in PGH without their knowledge. This person maintains his unanimous personality, refusing to show his identity even when being mobbed by TV crews. Such person incarnates the words in the scripture. mr. awan pusom, I am not against anyone, but i am just speaking through in behalf of my fellow Lagayanos.The most affected with the conflict and barbaric acts are the townspeople in Lagayan. Kaykaysuna nga makapan kami koma agkalap ken makigapas tapno ada ilako ken ipabayo a pagbiag mi ket awan a ta agbuteng kami met a mapan ta baka makitami ida ket patayen nakami met.Dayta ibagbagam mr. awan ti “pusom” nga makigapas dita asyenda yo sir thanks ket mabalin a koma no adda asyenda da nga agpayso ngem awan met sir ta awan mer nalawa a talon ditoy Lagayan ta puro met kapanaran(kabatuan) ti adda isu nga mapan kami gumatgatang dijay La Paz.Maminsan lng ti makatawen ti apit ditoy sir isu gundawayan mi koma ti mkiinnagaw ti pakigapasan. @ N HENNESSY, Sir, please watch the GMA documentary in you tube entitled “Batang hitman”.what you can watch there is the same as that in Lagayan. I wish that a respectable media be going to our municipality and ask the townspeople what is really happening here. Sorry Uttig ti ammok ngamin ti Laud ti balay ni Apo Mayor ket nalawa nga mabalin nga pagtalunan, ta ti ammok nagaramid ti IREGATION para it Lagayan,Dispensararen nak ta ti ammok ket inaramid na na asyenda daytoy Laud ti balay da, I’m soory. in addition sir, you may also watch “the blood politics in abra” also in you tube.And in relation to the topic above,are we abrenios waiting to a super typhoon that will occur also in our province to wake us up what is really happening here? Or maybe it should be done to be able us to feel the presence of GOD and treasure the life HE gave to us? I wl help the victims of yolanda in my own litle way so wd u uttig. Uttig gayyem,diak ammo no kasano nga sungbatan ka dayta nga saludsod mo,Of course mamati ak ti ayat ni Apo tayo nga Dios ket agkaragrag tayo koma amin tapno Masalba tayo ti didigra. Wen Uttig ti politics ditoy ayan tayo,nakarkaro pay ngem ti DELUBYO, ta daguitoy agtuturay tayo aramiden da amin nga kina sairo tapno makapuesto da ti Gobierno.We call that DO or Die just to take their Position which post they wanted too. Mamatiak nga saan nga padanonen ti Mayor ti Lagayan ti danum nga mapan parte ti Lapaz..Well I hope the PNP could help you with those problem. You better shut your mouth and sleep for the rest or your day and do this the next day again. You got a name the describes you very well. You got trash inside your head. So my dear friend sleep! Awan ti pusom such a crazy abrenio. The comment below is one I posted on Facebook as a reaction to a news about DILG Sec Mar Roxas’ poor handling of response and his poor attitude to CNN’s Anderson Cooper during an interview about how the Phil government is responding to the Yolanda disaster and its aftermath. His (Roxas’) callous and shallow city-brat responses revealed his propensity for defensiveness at the obvious lack of organization and absence of an agency in-charge of handling the disaster. Sadly, it is a pathetic reminder of our luckless fate with our government leaders. We see the same attitude and incompetence in various shades and levels amongst our officials – national and local. They are mostly clueless about responsibility and are experts in hypocrisy. Their view of decency is cosmetic. Their sense of humanity is rotten. And when we put them into authority to lead, they put nooses around our necks, cannibalise our souls for their defences and feed on our wretchedness to enlarge themselves. It is painful to see that despite this they continue to wield power and get venerated. The relevance of this comment to this thread is that, as PA stated, we get the government that we deserve. Having said this, we need to re-examine our values. We need to embed in our minds that we matter as human beings with rights and that we cannot simply go about our day-to-day lives as zombies or as scared subjects and passive constituents. I agree, Madam Norma. The reporters of CNN, Anderson Cooper included, were only reporting the news as they happened. Mar Roxas showed the whole world that he was incapable of handling the rescue and relief efforts. To hide his shortcomings, he vented his ire on Anderson. His wife, Korina Sanchez even added insult to injury by weighing in on Anderson in her radio program. Our countrymen in the Visayas were screaming, “Where is the government?” It was there for all the world to see. The mayor of Tacloban was complaining about the 700 body bags he requested from Roxas that was not given. The stench of death, they say was everywhere. Dead bodies were lined up in the streets for days. The irony of it all can be seen in the statement of Pres. Aquino to a CNN reporter saying that he was able to reassure the victims of help from the government, oblivious of the fact that people of Tacloban have been leaving in droves for Manila. It shows how out of touch with reality the president was. Pres. Aquino even chided reporters, telling them to show how resilient the victims of Typhoon Yolanda are. For days there was no food, no clean water, no medicines. It is as clear as daylight that the government wants to manage the news to hide their shortcomings. I am so unhappy with the way the president and his people handled this crisis. I know that we have an honest president. Is is too much to ask if he could be competent to boot? The same things happen everywhere in our country. People who have an axe ti grind against the government are being attacked. Perhaps, it is still not too late for our leaders to realize that only a true friend will tell you if there is dirt on your face. Onion skin and public service do not mix. Only sincerity, humility and public service do. Please not so fast to judge on what really happened on the ground. For what I’ve understood from Geraldine Wong testimony at Raissa’s corner (ABS-CBN News), ships could not dock nor plane could land on the very first day the typhoon stopped. But Anderson still blamed the government headed by Roxas for their untimely or slow rescue operation. What does he knows about our land, water, and air transportation in terms of availability or capability. I I think he was just overreacting trying to catch more worldwide attention by blaming the government for poor judgment or his sisters who might be friends of Napoles daughter supplied him that tooth-grinding information or ideas. He thinks that we are all dumb unlike the way his government handled the aftermath of their Katrina storm. Would they be able to rescue the victims right on time or was their President blamed for slow or delayed reaction in spite of their more sophisticated logistics than us? One mistake that Roxas made though, was he forgot to borrow our “Rakits” (bamboo shaft) and used our “bartek barselos” so that Anderson would have not been able to shout to the whole world his stupidity or ours. By the way, he allegedly admitted that he is a gay and Syoke was one of those who met and embraced him. cent they have spent with a 1000% interest rate and zero public service. clean even after my term ends in 3 years. 0.01% or less of our politicians in position right now. Unfortunately so, A-B-C OR D? However, life moves on and times keep changing. If there is one whose voice out there, no matter how small, stay long enough, there will be others that will catch on with it in time. For now, we must at least do what we need to do. Use the social media to try to squeeze out some good that is still left in the minds of our politicians. Habang buhay, sabi nga nila, mayroon pa ring pag-asa. Sana nga! Sad but true, A-B-C OR D? and Citizen Pinadis, not only in Abra but in the entire country. There is so much to be done but there is little time. All of the above sa politiko na alam ko na wala daw criminal sa angkan nila worst, he let ordinary abrenians killed by his foes and allies. Here’s an update on my earlier post about the donation-drive efforts from Abra. It’s truly nice that the response of our kababayans has been overflowing. Ergo, I’d say: If we – ordinary, long neglected common tao in Abra have maintained to have hearts of gold, we sure deserve QUALITY LEADERSHIP of integrity and high moral compass. Yes, Madam Norma, Abrenos can be counted upon to respond in times of need. There is no dearth of good, compassionate and industrious people in our province. They certainly deserve much more than what the government has done for them. You could not have said it better, integrity and a high moral compass are imperatives for good governance. Adda nabasak nga amin kano met nga Rummuar wenno Umuneg toy probinsya tayo nga Abra ket ag Tax da. Adda kano checkpoint diay Sinalang. Saan ko unay nga maawatan ngem ti kuna da ket uray kano pay Balikbayan Boxes nga ipatulod dagitay adda ti sabali nga Taaw ket masaka ti 1K bawat karton. Adda koma apo mangi ekplikar kadakami no anya daydiay ipatong da nga TAX ket kuna met dagitay agtratabaho diay ballasiw nga taaw nga nagbayad da ti Tax dan, nagbannogan da dagita ipatpatulod da no apay nga pakikbiangan pay la ti Municipyo ti Bangued. Ti pay kayat mi nga maammuan no kas pagarigan mapan ka gumatang ti personal mo nga gamit ti sabali nga probinsya tax san da ka? Adu ngamin ti kuro kuro nga mangmanggeg ngem saan mi met nga ammo no sinno ti dapat nga pagsaludsodan mi. Agyaman nak apo. This are BANDITS in broad daylight who enjoy the hardships of others. Nothing is going to the coffers of Abra they use this for there own personal needs & capricho.